Casey Dressler in The Wedding Warrior. Photo by Duv Wolff. BOTTOM LINE: There are plenty of reasons to laugh in this sweet and endearing comedy about the mishaps endured by a love-sick wedding planner while overseeing a wedding. For a freshly single woman who is trying to convince herself that she’s content alone, working as a wedding planner has to be a rather miserable undertaking. 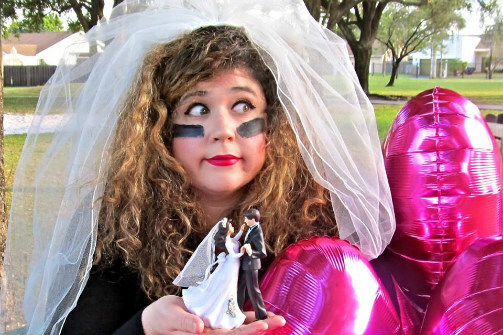 This is the situation for Casey Dressler in her one-woman show, based on her experience working as a wedding planner in the Florida Keys. While still reeling from a heartbreak, Casey (as she refers to herself/her character in the play) has to attend to planning and managing an ornate beach-front wedding that includes a high-strung mother of the bride who flips out when a lantern blows onto the beach. In addition to playing herself, Dressler also takes on the roles of her coworkers, wedding guests, and one enthusiastic wedding crasher. Dressler differentiates between each character by using differing accents, helping to switch characters without the aid of props or costumes. When Casey has to deal with such headaches as one of her team-members accidentally giving the bride's father marijuana, she is comforted by Connie, a sixty-something woman with a thick Southern accent. Connie warns Casey to not end up alone like her, telling her that she still has time to find someone and that she should not let go of the fantasy of marrying her true love just because someone broke her heart. During the course of the night, Casey also drives home a drunk Latina woman who tells her that the Cinderella story is a ridiculous myth that women have to learn to forget about. While juggling problems, Casey does her own soul-searching, wondering if she has any hope left for romance. The story ends with Casey heading towards hope amidst a night of mishaps. While the plot of The Wedding Warrior might seem to be the stuff of rom-com fluff (I think there is a movie where J. Lo plays a wedding planner), it has an authenticity owing to Dressler’s real-life experience. Her sadness seems relatable rather than forced or self-indulgent. She also shows a great knack for comedy as she shifts into kooky characters and parodies women setting up for a fight when it’s time to throw the wedding bouquet. All in all, The Wedding Warrior is a sweetly endearing comedy. The Wedding Warrior is written and performed by Casey Dressler. Directed by Kim St. Leon. Lighting Design is by Christopher Michaels. Sound Design is by David Hart and Casey Dressler.